The best pillow for headaches will help you sleep better by allowing your neck and spine to be in the right alignment through the night. Headaches and migraines can be cause by poor sleeping posture because the nerves in the neck area get irritated due to being in a misaligned position during sleep. With the right pillow you’re able to relax and sleep in a position that’s natural to your body which will reduce the nerve irritation in the upper neck which gets rid of your headaches. Here are our top choices for anyone suffering from headaches or migraines and looking for relief. Best Pillow for Headaches: If you suffer from headaches that interrupt your ability to get quality sleep, getting a pillow like this one that aligns you neck with your spine with the proper curvature helps offer relief. The Sleep Innovations Contour Memory Foam Pillow was made specifically for those with chronic pain of the neck, back and shoulders. The former of which can often-times lead to headaches throughout the day. Its riveted shape allows the back, shoulders, head and neck all to rest with equal pressure on a bed. This helps in reducing and preventing future pain both in and out of bed. The contoured shape also helps to align one’s spine, which just an added plus. If headaches are your only concern, this pillow should be right up your alley. While perhaps not the most advanced piece of pillow technology, it does a great job of reducing pain without adding any extra features (such as cooling) that you don’t feel like paying for. It also comes with a five year warranty, which is when pillows are usually replaced anyways. It’s basic, it’s to the point and it does the job – what more could you ask for in a headache pillow? With Cooling Features: If you like the pain relieving effects of contoured pillows, and don’t mind the feel of them (some people don’t like sleeping on the uneven shape), then you’ll enjoy the extra addition of cooling that this memory foam pillow comes with. The Sleep Innovations Cool Contour Memory Foam Pillow is much like its not-so-cool cousin of similar name above. Featuring the same shape, comfort and pain management/prevention, they would look nearly identical at face value. The difference between the 2 being the cooling feature. 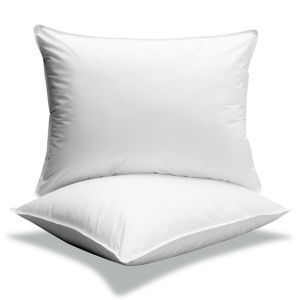 As a result, you’ll quickly notice the structure of the 2 pillows are different in terms of their layers. This one having a light blue colored upper layer (the cooling layer), and the lower foam (white colored layer). Whereas, the previous one is solid with one material. The cooling factor also makes this pillow more expensive, costing almost twice as much. The Cool Contour features a 25% polyester make-up, presumably in its outer layer to keep users cool. Staying cool is the main difference between this model and the standard version (the product above). While perhaps not the best headache pillow (or the best cooling pillow) in terms of where emphasis was placed during production, this pillow is a great compromise between headache relief and cooling. This makes it a “jack of all trades” so to speak giving you a good dose of both, but not the best of either. Headache sufferers looking for something which is effective and keeps cool can’t go wrong with this pillow for its overall combined quality in both aspects. Those who are looking for a pillow that helps with headaches, offers cooling and isn’t contoured can consider this product. Made with memory foam, it is constructed with a ventilated cooling system that helps dissipate the heat that’s usually associated with memory foam pillows. Those looking for a pillow with more emphasis on cooling rather than headache relief while still retaining each quality would be wise to go with the Classic Brands Conforma Memory Foam Pillow. While its dimensions and memory foam do indeed aid in pain relief, the pillow’s ventilation system is where things truly get interesting. The ventilation system is, to keep things simple, a bunch of holes. But as far as a pillow full of holes goes, you’re looking at one of the best. This type of ventilation system is arguably one of the best when it comes to keeping things cool. Its medium level of softness keeps it versatile and able to assist in any pain relief required without sacrificing practicality or usability once the pain goes away. This is an all-around pillow that offers a combination you want for headache and neck pain relief as well as soft but supportive density. While the My Stunning Abode Neck Pillow is (obviously) marketed as a pillow aimed at supporting a healthy, properly aligned neck, it’s actually quite versatile in that, aside from its neck support, we are seeing every other great feature seen in other pillows to some degree in another. you’re not getting the most dust-reducing pillow either, but it certainly does have some dust-reducing qualities. It does a great job of reducing headaches and other pains, while offering nice little surprises here and there in the form of added features; it truly has one of everything. This one is great for headache sufferers who can’t decide on which other features they’re looking for in a pillow – this one has them all so you get all-around coverage. The best pillow for headaches will not only let you sleep better through the night, but it will also reduce the intensity and frequency of your migraines or headaches. This will let you function much better during the day and be able to enjoy life more.